The objective during the construction of the Zavora Marine Lab was to build an exemplary and unique research station, accommodation, and education centre using eco-friendly, zero-waste techniques. The buildings themselves represent what ZML stands for: conservation, environmental protection, resourcefulness, and simplicity in nature. Andreea Gross, eco-architect and fellow diver, volunteered to design the Zavora Marine Lab. The station combines low-impact materials, temperature control, and zero-waste techniques. The buildings also make use of garbage, in particular glass bottles left over from Mozambique’s lack of waste management system. 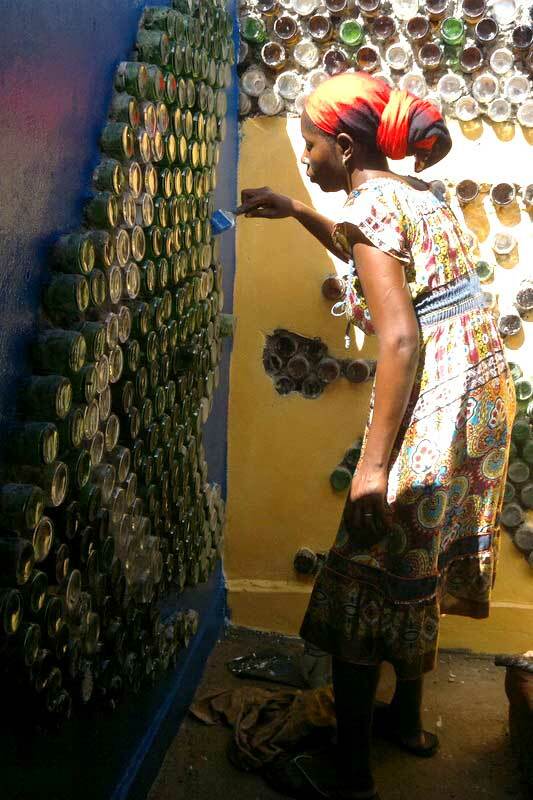 Over 10,000 bottles sourced from the community were used to make beautiful designs in non-structural walls. Locally made low-cement bricks make up the majority of the buildings’ structure. These bricks only use a small amount of cement and are compressed using a jack-operated brick maker. Compressed bricks don’t require thermal processing, therefore saving surrounding trees from becoming firewood for a kiln. A solar generator provides hot water and saves energy. A three-filter water system sends clean water back to the environment. The building use eco-friendly techniques that are simple and well planned to reduce environmental impact during the construction phase and in day-to-day operation. Glass bottles, wood from old and non-productive coconut trees, other recyclable materials, and a small amount of cement and rocks are the main construction materials. The combination of these materials is an example of sustainable use of natural resources and might be replicated in other areas to reduce environmental damage. Local community members contributed to the construction of the research station. Most were new to the concept of using recycled materials as alternative building resources. The learning experience and construction skills can improve their livelihood and well being. The socio-environmental benefits do not stop with the building project. Environmental education is crucial to raise the level of understanding and forms the baseline of sustainable development. This project was made possible due the kind help of volunteers, the U.S. Embassy through the Ambassador Small Grant, USAid, and eco-architect Andreea Gross.